Browse our Finest Selection of Luxury Villas in Asia using our Advanced Filtering System. Search villas by destination and/or number of bedrooms and show results real time. For a more detailed information of each property, you may visit our luxury villa destination pages directly as follow: Phuket Villas, Bali Villas, and Koh Samui Villas. All of our luxury villas include an excellent chef, villa manager, staff, and dedicated concierge to attend to your needs and requests for the duration of your stay. There are some truly fantastic luxury vacation villas in beautiful destinations in the most stunning settings. Then there is Villa Ani Thailand; a magical island world all of its very own. The 10-suite villa transports guests to another dimension of beach vacation experience that is quite simply extraordinary. An architecturally standout two-level chalet in Niseko, The Glasshouse is an uber-cool, designer-style five-bedroom stay with a gorgeous upper level with dramatic glass walls that look out from all sides to a glorious natural scene and uninterrupted views of Mount Yotei. This 5-bedroom beachfront luxury vacation home in Koh Samui offers a sweeping views of the island’s stunning west coast. Perfect as a tranquil retreat destination, this luxury villa is tastefully accentuated with a mix of Thai and Japanese furniture & decors. A luxurious ski chalet right in the middle of a Hirafu Village in Japan’s famed ski resort destination of Niseko, Hakuchōzan is a four-level vacation wonder with seven en-suite bedrooms that excites, inspires, and entertains; defining a superior ski-holiday experience with its incredible features. This ocean view 4-bedroom luxury villa in Koh Samui is situated in one of the most picturesque locations in the island. It can comfortably accommodate up to 8 guests, a perfect choice for a fun filled family vacation or a romantic getaway. 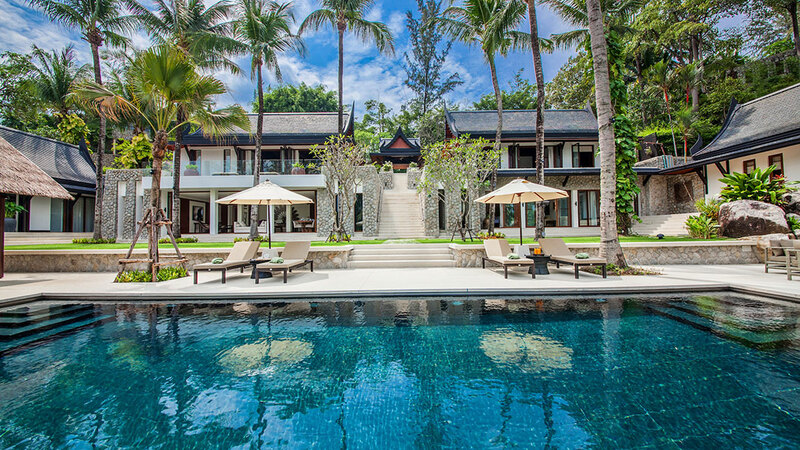 On the secluded beaches of the island, a marvel of traditional Thai design and architecture sits proudly along the coast line is a private luxury villa for rent, spanning three acres of private beachfront property w/ a distinction of being one of the most luxurious. Villa Hin uses a unique natural rock formation as the foundation of its design. The striking and creative architectural design of this Koh Samui luxury villa rental is one of a kind that creates feelings of tranquility, seclusion, and relaxation in a tropical paradise. Surrounded by some of the most breath taking tropical rain forest, Luxury Villa Praana is as stunning to behold as its wondrous natural surroundings. This ultra luxury Koh Samui pool villa provides an incredibly lush tropical back drop perfect for both a serene retreat destination or private event venue. A private luxury holiday home nestled on an elevated piece of property right on the beach in Taling Ngam, Isle View Villa in Koh Samui will make you feel as if you’re suspended in air amidst the wide blue tropical sky with the spectacular ocean right under your feet. Located at the lower end of Hirafu Village, six-bedroom Zekkei is a spectacular three-level chalet that affords outstanding views of Japan’s Mount Yotei. With an exterior that has the feel of a log cabin retreat, the interior is spacious with big-window views that are inspiring. Situated on the scenic east coast in Cape Yamu, this 4-bedroom luxury villa in Phuket boasts a beautiful panoramic view of the ocean and surrounding foothills. One of the finest luxury holiday homes in Phuket, Villa Padma is in an ideal location to enjoy everything the island has to offer but far away enough to enjoy island serenity. Undoubtedly one of the finest properties on the island of Phuket, Villa Mayavee is a true architectural gem. This luxury private vacation home rental offers a contemporary home away from home set amidst the incredible lush forest on a secluded peninsula in Kamala. This beachfront 7-bedroom villa blends spectacular features and retreat-style relaxation; a combination that creates an unparalleled villa experience you will ever have. A red-carpet A-lister on the Phuket villa rentals circuit, Villa Amarapura is designed to provide every guests an abundance of luxury amenities. Villa Analaya is located in the exclusive Laemson Estate on Phuket’s Millionaire’s Mile. It is situated on a small peninsula near the mesmerizing Kamala Beach, which means that you have a gorgeous sea-facing view and stretches of white sand awaiting you. You can see the turquoise waterfront of the Andaman through the thicket of green palms. Situated on the scenic east coast of the island in Cape Yamu, this 5-bedroom luxury villa in Phuket boasts a beautiful panoramic view of the ocean and surrounding foothills w/ best sunset display you will ever witness, that will perfectly soothe your senses. Located on the West Coast in the Surin beach area, Villa Yang Som is a 5-bedroom luxury Phuket villa rental with a combination of traditional Thai-style house and modern design, built on an upscale hilltop private community with the panoramic view of Andaman Sea and Bangtao bay and its fine white sandy beach. A luxurious 6-bedroom villa to rent in Phuket, situated on the east coast facing the amazing Phang Nga bay, Villa Ocean’s 11 is one of the finest luxury villas for rent in Phuket with its tasteful artistic but minimalistic decor, flawless furnishings, the breathtaking views, and a beach on its front. Nestled in the scenic forest landscape of tranquil Lower Harifu Village, Mukashi Mukashi is a 2016-built chalet beauty with seven en-suite bedrooms, designed as a sanctuary that effortlessly becomes part of the stunning Niseko scenery. This 5-bedroom luxury villa for rent in Phuket is an utterly amazing accomplishment of modern architecture situated in one of the most picturesque locations on the planet. Few places in the world can rival the stunning natural beauty of Villa Saengootsa. An exclusive estate perched on the luxurious Cape Yamu peninsula on Phuket’s idyllic east coast, the stunning Villa Sawarin is a 9-bedroom vacation-stay beauty; combining contemporary design with charming Thai style to create a splendidly relaxing retreat overlooking the Andaman Sea. Located on the west coast of Phuket, Villa Aya is a three-storey, 8-bedroom villa overlooking a panoramic view of the Andaman Sea. This luxury property is located about 40 minutes from the Phuket International Airport and the Phuket Town, while a plethora of dining options are all within a 15-minute drive away. Yanagi is a modernist’s design dream with a breathtaking exposed-timber façade that blends beautifully with the tall forest trees of Japan’s Niseko ski-resort destination and echoes the beautiful natural landscape. Perfectly designed to offer all that guests need during a Niseko stay, Annabel is a chalet darling in the quiet Izumikyo 2 district on the edge of Hirafu Village, a short shuttle-bus ride to the slopes and nearby bars and restaurants. This classic magnificent Bali pool villa rental is located in the quite area of Seminyak. With an expansive outdoor patio, private pools, and astonishing views of it’s own lush gardens, its serene, quiet surroundings are reminiscent of a paradise set amidst Seminyak’s cosmopolitan community. Villa Ambra exemplifies the paragon of luxury holiday in a location that is an inbred element of traditional Balinese rural life. This luxury vacation home rental has the best acclimatization for Bali’s fabled sunsets. On one side of it is the beach, on the other side is a river sanctuary, and inland are the beautiful rice fields. Beautiful & Magical. This private villa rental in Bali is indeed a “heaven on earth”, with many of our guests insisting that it is the best villa they’ve ever stayed at. The elegant Villa Yangan is situated on the southern west tip of the islnad and in magnificent gardens on top of a cliff in Uluwatu, above a delightful white sand beach. Located closed and snug in the hills of Ubud is this beautiful luxury Bali villa for rent that overlooks the rice paddy fields alongside the Ayung River. This luxurious estate with a classic Javanese design is perfect for a great Bali retreat experience, just 7 miles from the center of Ubud. The extraordinarily luxurious Villa Laem One hosts top-tier tropical views of the Gulf of Thailand and neighbouring islands, displaying some of the most exclusive amenities and state-of-the-art features that one can find in Koh Samui. This 6-bedroom exotic dreamland is conveniently situated near fishing village Thong Krut, home to fresh Thai produce. Located in a traditional Balinese fishing village, it is worlds away from the hustle and bustle of crowds, but also near the best surf spots on the island, the famous Bali Safari Park, and Ubud is a just a few minutes away. Offering six spacious bedrooms, with one master suite, one ocean view suite, and four guest rooms, Villa Vana accommodates a total of 14 adults and eight children, making it a private villa estate that an entire family can enjoy. Merging an ambiance of a private villa and luxury resort, Villa Katrani Koh Samui is a beautiful piece of hilltop property that oozes relaxation and sophistication. Located in the Taling Ngam area, the villa offers spectacular views of Koh Samui’s turquoise waters and breathtaking formation of nearby islands.